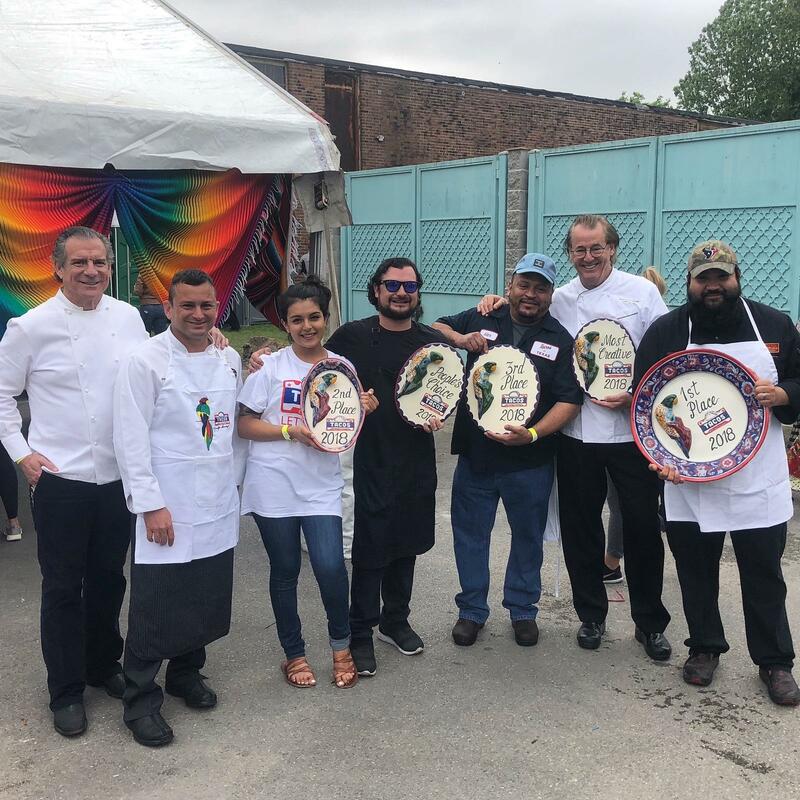 Chefs who attended and competed in the 2018 Tacos Over Texas included (from left to right) Michael Cordua, Dominic Laurenzo, Naomi Silva (holding Kiran's second place prize), David Cordua, Alex Padilla, Robert Del Grande and Donny Navarette. Photo by Nick Scurfield. 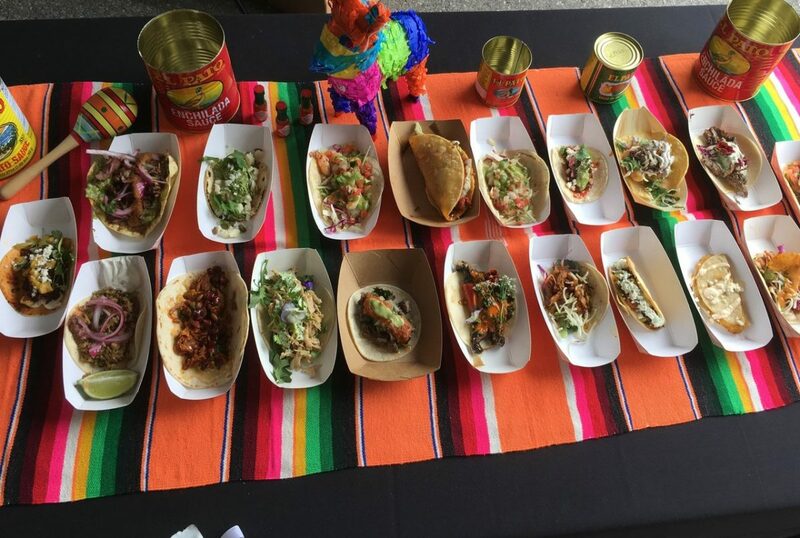 Sixteen Houston restaurants competed yesterday in the inaugural Tacos Over Texas competition. Hosted at The Original Ninfa’s on Navigation, the restaurant founded in 1973 by “Mama” Ninfa Laurenzo, it paid homage to one of the city’s most famous matriarchs and pioneering female restaurateurs. She died in 2001 but her impact on Houston’s restaurant scene remains. These days, Legacy Restaurants owns and operates The Original Ninfa’s and chef Alex Padilla runs the kitchen. The children Laurenzo had with her Italian husband, Domenic—and, later, her grandchildren—went on to have their own successes with Tex-Mex chain El Tiempo and Italian restaurant Laurenzo’s. It’s significant that the Tacos Over Texas competition brought the Laurenzo family back to the restaurant founded by Mama Ninfa. In fact, family members helped spearhead the competition. It wasn’t just about taco bragging rights, though: the competition raised money for the Ninfa Laurenzo Scholarship Fund, which uses donations to send deserving students from underrepresented backgrounds to high school and college. Selections of all the taco entries for the inaugural Tacos Over Texas competition. Photo by Zaide Scheib. Chef Donny Navarette gets ready to put the finishing touch on his tacos. Photo by Holly Beretto. 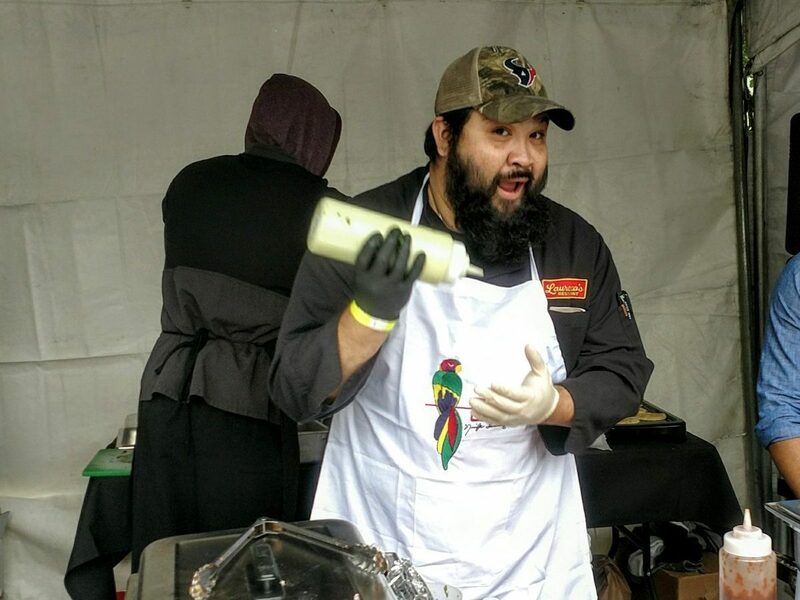 Led by chef Donny Navarette, Laurenzo’s took home the top prize, causing executive chef and Mama Ninfa’s grandson, Dominic Laurenzo, to quip, “I told him to do a sausage and pepper taco. I’m so glad he didn’t listen to me!” Navarete won for his carnitas-style taco, made with prime rib topped with guacamole cream and his own nod to Ninfa’s “atomic salsa” flavored with a bit of Dr Pepper. “I’m so proud of the legacy Mama Ninfa left us and the real winners today are the kids,” said Padilla. On a somber note: a motorcycle driver who was not attending the event struck two guests at the corner of Navigation and Delano as they were leaving the competition. The driver apparently hit a van before careening onto the sidewalk. One of the injured is a friend of Phyllis Mandola’s. EMS and Houston Police were called to the scene. One victim suffered a broken knee; the other a concussion. Hopefully, both will make a full recovery. I cannot believe that Mama has been gone for 17 years. The magnificent funeral mass at annunciation church was a sincere tribute to her. Beth, I enjoyed meeting you, too. And I am so relieved to hear about your friends. Thank you for a wonderful event — looking forward to more to come!